As consumers grow increasingly tech-savvy, companies and products are progressively evolving to meet digital needs, and perhaps ultimately connect with the ever-present smartphone. With products ranging from smart hairbrushes to UV patches that inform the wearer when they have reached the maximum acceptable sun exposure, it is safe to say that technology is slowly but surely shaping the beauty industry. At CES 2017, Kérastase partnered with Withings to unveil the world’s first-ever smart hairbrush. The Kerastase Hair Coach Powered by Withings and its accompanying smartphone app earned this year’s International CES Innovation Award. The brush is intended to help consumers prevent aggressive hair brushing, which often leads to damage, breakage and split ends, by using sensors built in to the hairbrush to inform users of the state of their hair and how they should be taking care of it. A microphone in the head of the brush listens to the sound of the hair during brushing. This can then give the user feedback on hair’s manageability, frizziness, dryness, split ends and breakage. The force at which one is brushing their hair is also measured through three-axis load cells. These cells work alongside an accelerometer and a gyroscope to count brush strokes as well as send vibrations to the brush handle to signal to the user that they are brushing too hard. The brush is also equipped with conductivity sensors, which take into account whether hair is wet or dry and how the hair can be accurately analyzed. Users can then log on to the app to view results of their hair analysis as well as see what products have been recommended for them. This brush retails for $200. L’Oréal has also been developing the mobile-friendly L’Oréal Hair Colorist/Paris, a consultation tool that allows consumers to live chat with a hair color specialist to receive hair color advice, help correcting coloring mistakes and receive product recommendations. "Technology is transforming consumers' daily beauty routines, and smart devices have huge potential to impact how we care for our hair and skin." Another debut at CES 2017 was the HiMirror Plus. Retailing for $259, this mirror is designed to detect and analyze wrinkles, fine lines, complexion status, dark circles, spots and pores, while also recommending products for the specific skin issues. Smart ambient makeup light: LED lights simulate five different lighting scenarios including sunset view, outdoor on a sunny day, brightly lit office, shopping mall or supermarket and restaurant or party venue. Increased memory: six users can now use the smart mirror, it was limited to four before. The mirror also allows users the ability to record and save skin analysis for a longer period of time, this allows users to better track skin improvements. partnership with the creator of 3D virtual dressing room, Swivel, FaceCake Marketing Technologies, Inc. 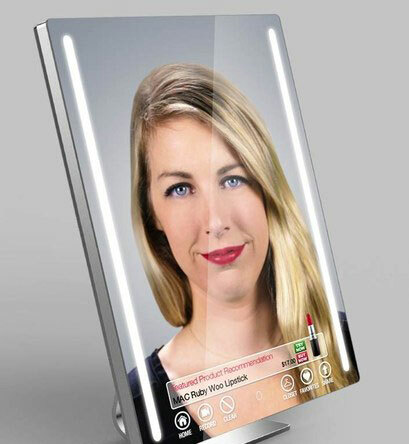 This mirror uses adjustable LED lights and a sensor that factors in natural or artificial light of the user’s surroundings, and allows them to “try on” cosmetics and accessories virtually. The real-time reflection will also provide the user with personalized recommendations and purchase options. While technology has had an impressive effect on beauty products and services, it has also amped up the way that consumers hear about them. Nevada-based cosmetics company, Nexsey LLC, knows first-hand about the power of the viral video. The company produces a medical grade tape, Nexsey, that is used to tighten neck wrinkles.